1945. 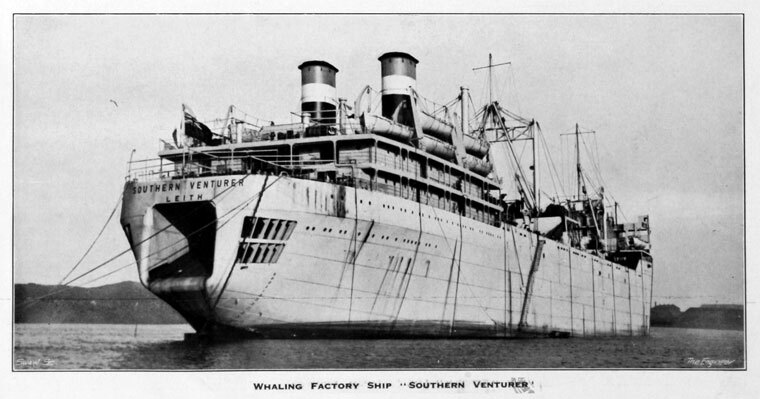 Whaling Factory Ship "Southern Venturer"
This yard was part of the Furness, Withy and Co shipbuilding empire based in Hartlepool in England, otherwise referred to as the Furness yard. WWI: The Furness Yard was built as an emergency shipyard to cope with the repair requirements of World War I. 1917 Incorporated as a Private company. The shipyard was authorised under the wartime emergency programme and construction began in 1917 on an 85 acre site (50 acres reclaimed from tidal land) and offering 2500 feet of frontage onto the River Tees at Haverton Hill, on the north bank opposite Middlesbrough. The finished yard had twelve building berths (ranging up to 700 feet) and a fitting-out basin 1000 feet x 250 feet. 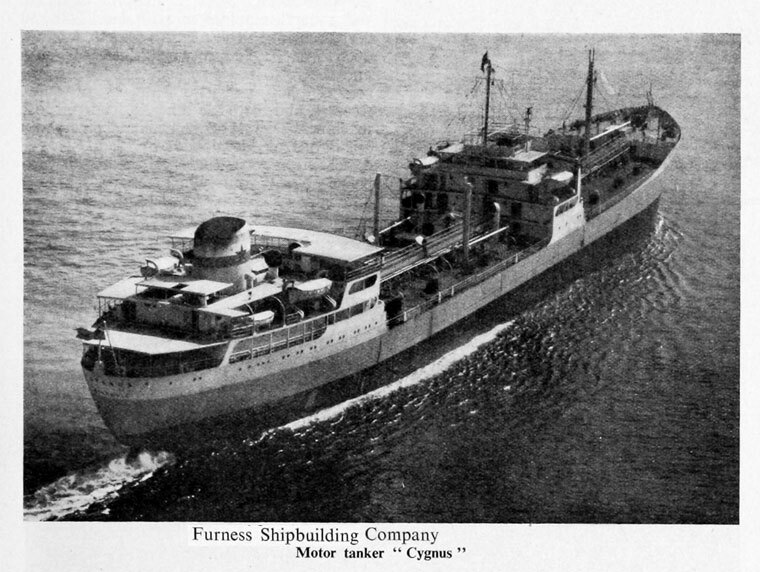 It was a subsidiary within the Furness shipowning group. 1918 Started manufacturing. The first keel was laid in March 1918 while the yard itself was still under construction. 1919 A number of ships were ordered by and manufactured for the British Government along with orders from foreign companies. In mid 1919 the Furness family resigned from the Board of Furness, Withy and Co and a management buyout happened. This meant that during the first half of the 1920s there was a constant supply of orders for Furness, Withy & Co and its subsidiaries. During the 1920s the yard made a number of colliers and, in 1924 an unusual two-masted schooner Princess was launched. The yard went on to build many tramps as well as five deep-sea tankers. 1926-30 The yard used its outfitting-basin to make a number of bridge-forward/engines-aft Great Lakes grain traders and gypsum rock carriers. Notably, "Cementkarrier" which was one of the first diesel-electric ships built in the North East. 1927 In the late 20s the yard manufactured twin-funnelled passenger/cargo liners. Whaling vessels were also made by the yard. 1932-35 Most of the Furness, Withy yards were not in use, with only three small tankers, a cargo ship and a few tramps and colliers being made. 1936 Trade picked up, 11 ships were made in this year. 1947-63 The yard made over 76 large ships and tankers. 1951 (presumably) The yard was acquired by Haverton Holdings. 1961 Shipbuilders and constructional engineers producing vessels up to 52,000 tons d.w. and steelwork for bridges and gasholders. 2,750 employees. 1963 The yard was modernised so that it could build the supertankers and bulk carriers that dominated modern shipbuilding. However, after the launch of its first giant bulker Essi Gina, the yard was without work for the first time ever. New orders were soon obtained though. 1968 March. Announced the closure at Haverton Hill, Middlesbrough during this year with the loss of 3,000 jobs. 1968 The Furness Yard was merged with the Swan Hunter Shipbuilding consortium. 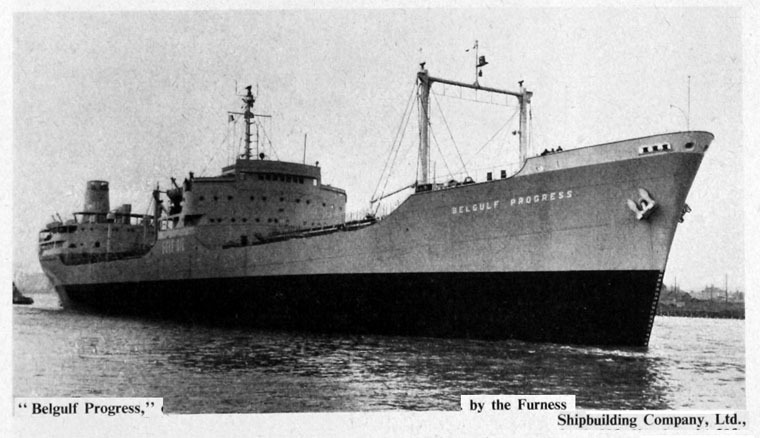 1970 The first giant ore/bulk/oil carrier, Furness Bridge was launched in 12th October. Six others were launched at the rate of 1 per year. 1977 The yard was nationalised. 1979 The yard closed down, having been placed on a "care and maintenance" order. However, much of the structure of they yard is still there today. This page was last edited on 2 May 2018, at 14:33.